My sincere thanks to the Young Regional School of Music for permitting me to make the recording available here. tho’ they’re calling it “The Old Tin Pot”. For she doesn’t wear a lid. The old girl never did. As she sits among the crowd each Saturday. Where a man may drop his quid into the cup without a lid. in a fashion that’s not easily forgot. When playing for “the Old Tin Pot”, Good shot! Just play Rugby League as best you can. See they play to win, Hoop-Ray the score goes up. When playing for “the Old Tim Pot”, Good shot! When [insert your team] wins “the Old Tim Pot”, Good shot! The conventional wisdom seems to be that this tune was penned back in 1927. I disagree. William Herbert Howard, was known as Herbert or Herb. He spent his whole life in Maher Cup country, but he was not your regular Maher Cup ‘type’. Born at Tumut in 1890 we was one of eight children born to Isabella (Regent) and William Henry Howard. They were from the district’s pioneering families. Grandfather George Howard established a very successful footwear retail and repair business in Russell Street. Brother Edgar Mansfield Howard was an alderman and the proprieter of the Tumut Times and Adelong Argus. By 1920 Herbert Howard had moved to Junee with Tumut friend Roy Elphick. There W.H. Howard spent the next thirty years, mostly working as an accounts clerk in the office of J.S. Taylor’s big Broadway Store. Brother E. Mansfield Howard and a relative, the Reverend Harold Howard, also moved to Junee. Herbert was a confirmed bachelor with a love for music – being the organist and an office holder at St. Luke’s Church of England, the town’s bandmaster, dance band leader, and church choir conductor. For many years he would take the Junee choir to his home town for the Tumut Eistedfford. They often won. J.S. 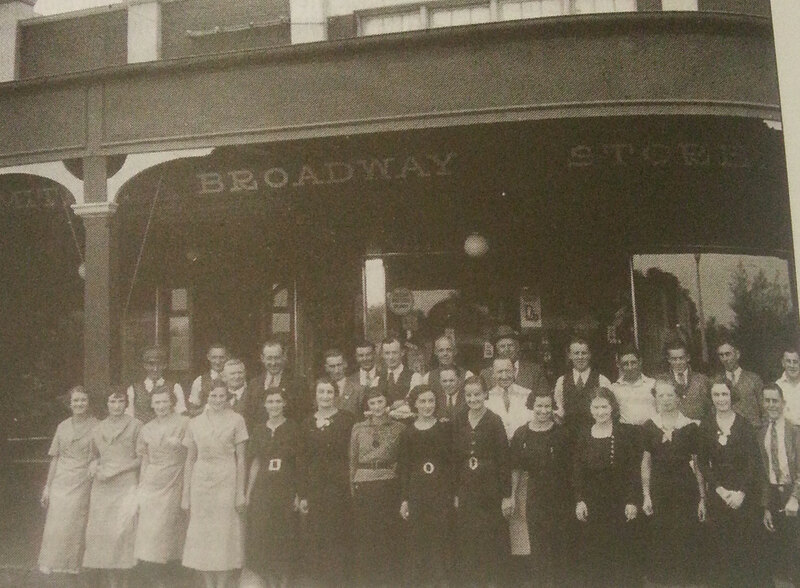 Taylor’s staff in 1936. Herb Howard 5th from left in back row. centenary celebrations. He wrote other music and lyrics. In 1948 he put to the mayor of Junee the proposition that the town could have a choir of up to 1000 voices. Luck came his way in 1952 when he won a considerable sum in a lottery. He soon after retired back to Tumut. He may have penned more songs there, including, I believe in 1953, The Maher Cup Song. W.H.Howard died at Tumut in 1961. Junee (It’s There I’ll Soon Be) , with Herbert Ardlaw McVittie (1927). This song was renamed Back to Junee for the town’s jubilee in 1935. Dearest Little Town To Me: an Australian song (1930). The little town is Tumut. The Australian pre-occupation with sport is often criticised for relegating the arts to the background in country towns. It seems that in the Junee of William Herbert Howard they were both comfortably accommodated. The lyrics refer to games being played on Saturday. Up until 1946 the Maher Cup was played on Wednesdays. PS. Another song that evokes memories of the Maher Cup is You’ve Got To Be A Football Hero, which introduced 2LF’s Rugby League show that I remember on Saturday mornings. Below is a You Tube video uploaded by Nick Ball. The images are from British association football but are still evocative and entertaining. This entry was posted in Social Life and tagged Herbert Howard, Junee, Tumut. Bookmark the permalink.